News dropped yesterday that 1/10th of all YouTube viewing per day was now taking place on TVs. And since Google states that 1B hours of content is consumed daily, that’s 100mm hours, so nothing to sneeze at. But this illuminating stat brought to mind a realization far greater than just the minutes logged; the fact that they’re being logged on a TV, which was the main source of audience attention for many decades that networks ponied up significant amounts of money to create professional content and sell advertising against. 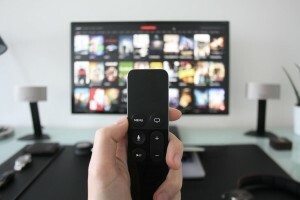 The proliferation of internet connected TVs or devices like Chromecast, Fire Stick, Roku, etc (which will one day become obsolete as ALL TVs will be internet enabled from the get go) means audiences are engaging video content in the same way of yesteryear: relaxing on a couch or sofa, in front of the TV. But now, it’s no longer just professionally created content, but YouTube creators too. Sure, a small percentage is likely driven by YouTube Red, which they didn’t disclose, but the majority is UGC. This is big for influencers and advertisers. Why? Because as older formats of digital advertising become less effective, eg display advertising, whether it’s from banner blindness, the shift to mobile (less real estate on device screens) or ad blocking software, integrating products or services into engaging ad formats is becoming more sought after. The content is the ad, and done more authentically, since the audience feedback loop is instantaneous and content creators will not sacrifice credibility for a few extra bucks (actually, it can be significant depending on video view size, but small with a long-term view in mind). What makes this so exciting is brands are now able to deliver that level of connection to an audience watching videos through a TV set! It’s no longer just integrations being watched from a phone, table or PC; every minute watching YouTube videos on a TV is a minute not watching linear TV, and that attention is what advertisers are desperately after. Therefore, the time is ripe for sponsors to make a big splash with YouTube influencers since the data shows how influential their content can be, and we all know how impactful advertising on TV has been.